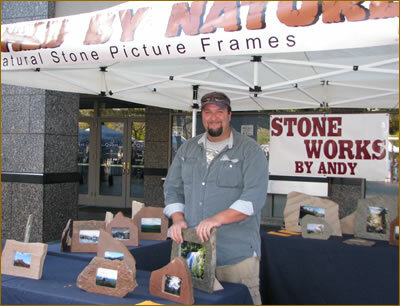 We are pleased to introduce you to our recent find, stone photo frames, created by a local Boise, Idaho craftsman. Stone Works by Andy. While visiting downtown Boise one Saturday morning, we were thrilled to discover photo frames created in stone by a local artisan. Andy Spencer, owner and artist, has been doing stone work for over 20 years. His beautiful natural stone creations were on display at the Boise Farmers Market. Natural stone picture frames he titles Framed By Nature. Andy Spencer, a full-time dad, tells me he started this part time business over a year ago. He previously worked for Arizona Stone Creations in Scottsdale, so it is obvious that he has the skills and qualifications. In addition to his stone creations on display, Andy also creates specialized work for clients. Internet Success highly recommends Stone Works by Andy. Give him a call or find him at the Farmers Market in downtown Boise. This is a Flickr badge showing items in a set called Boise Farmers Market. Make your own badge here. See Julie's flickr pics of the Boise Farmers Market.